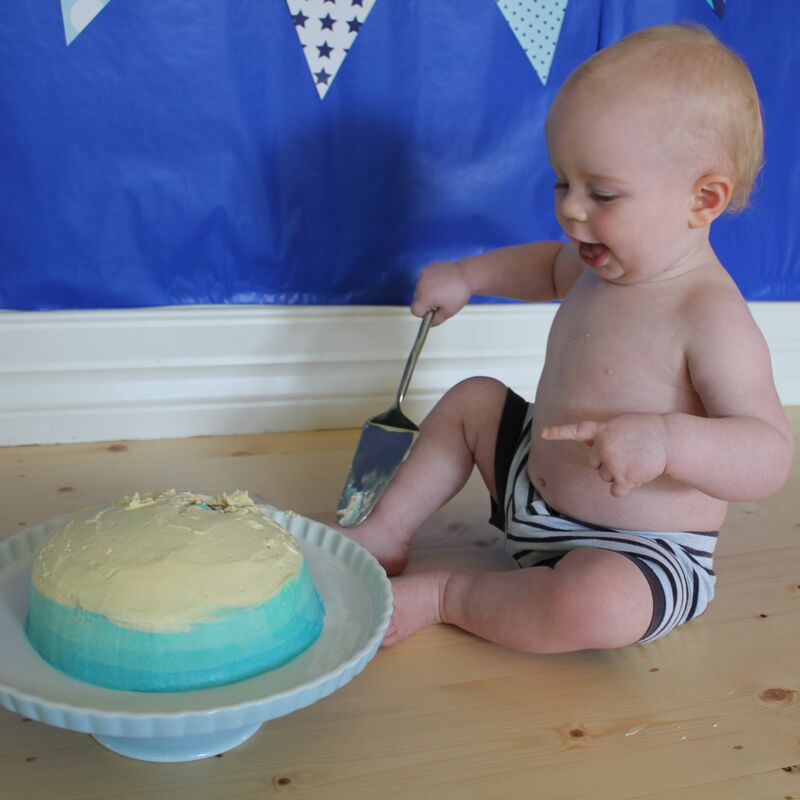 Last week I shared the littlest lad’s first birthday DIY Cake Smash. For the cake smash I used a DIY ombre cake. It was my first attempt at ombre and I have to say, it’s deceptively simple and really very pretty. 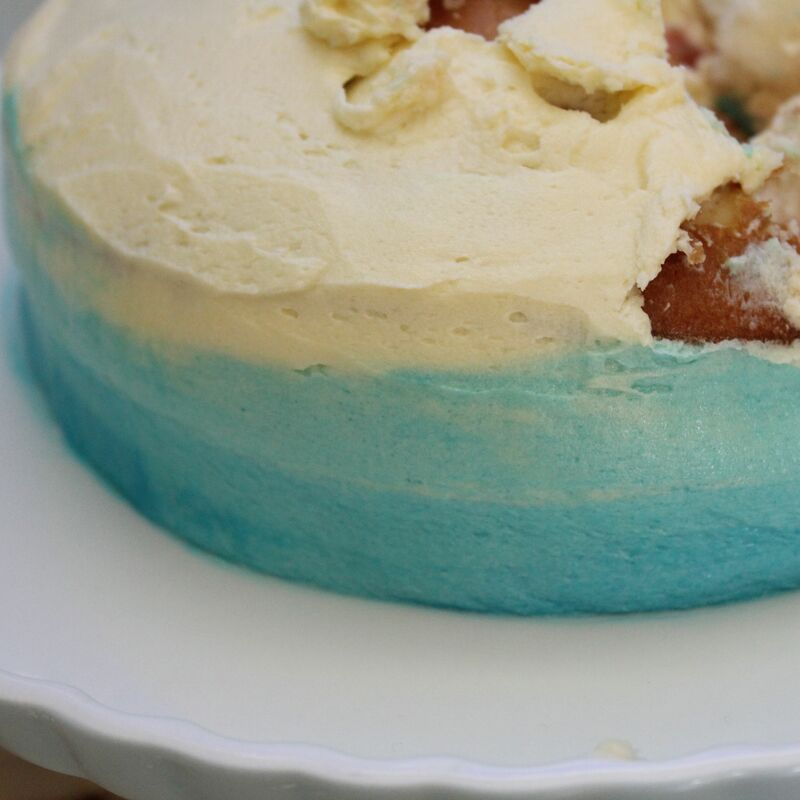 Here’s a step-by-step guide to make a colourful and sweet DIY Ombre Cake. You’ll need some plain buttercream icing (I use this recipe), food colouring for the colour scheme you’ve chosen, a piping bag and a palette knife. Then you’re set to whip up your own DIY ombre cake masterpiece. Given I was using this cake for a cake smash and I had no plans to eat it, I bought a cheap filled sponge. Basically, you need a round cake. Make it yourself, buy it, whatever works for you. 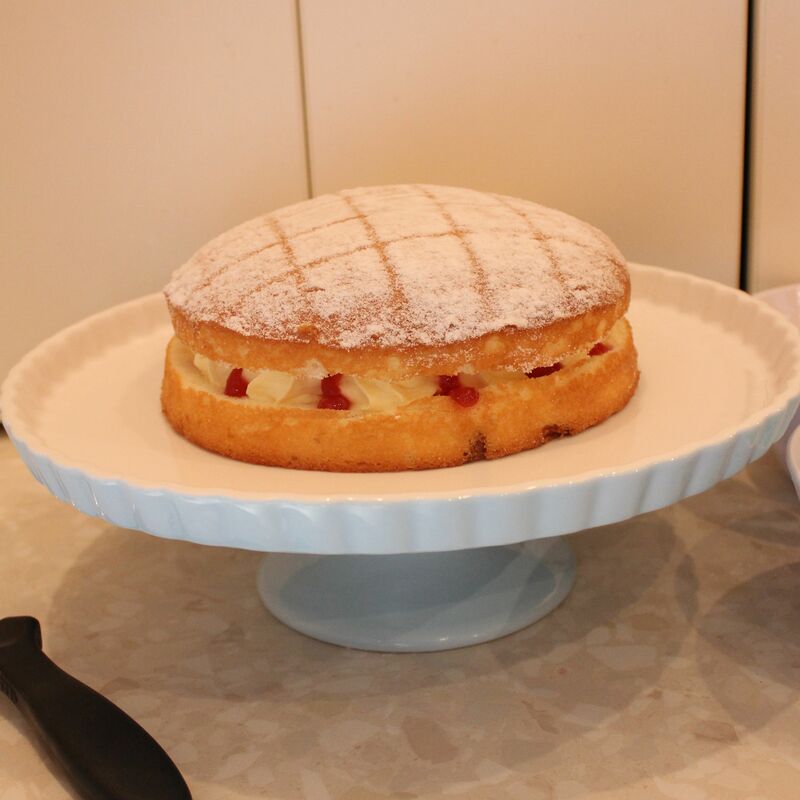 Here’s a tip, the icing sugar sprinkled on the top of some store bought cakes stops buttercream from sticking to the cake. I carefully wiped off the icing sugar with damp paper towel. Very high tech here on Wallace! 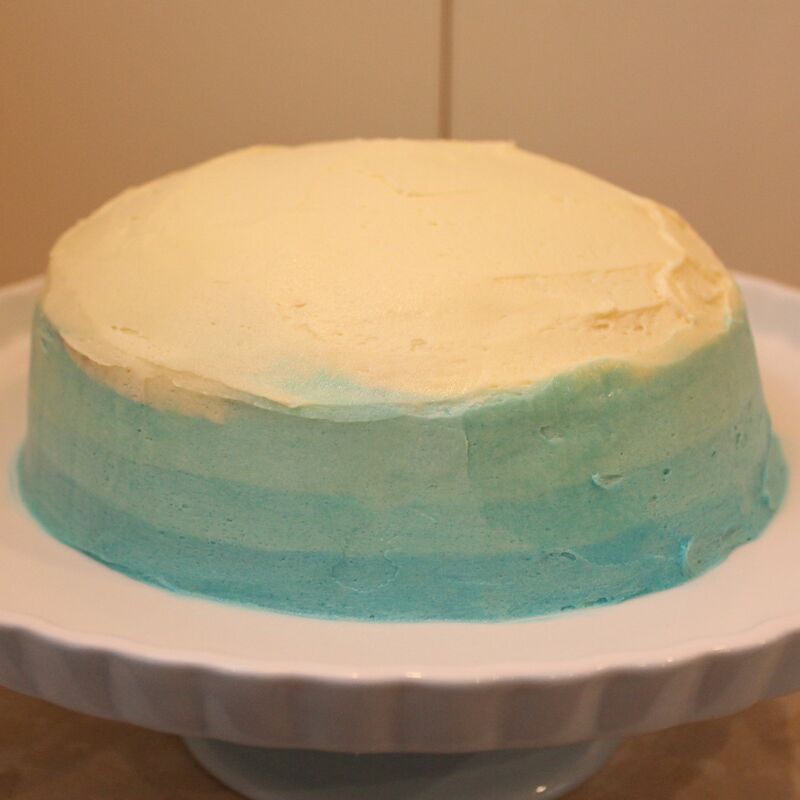 Decide the colour you’d like on the top of your DIY ombre cake. I went with white. Plonk a large dollop of buttercream in that colour on top of the cake. 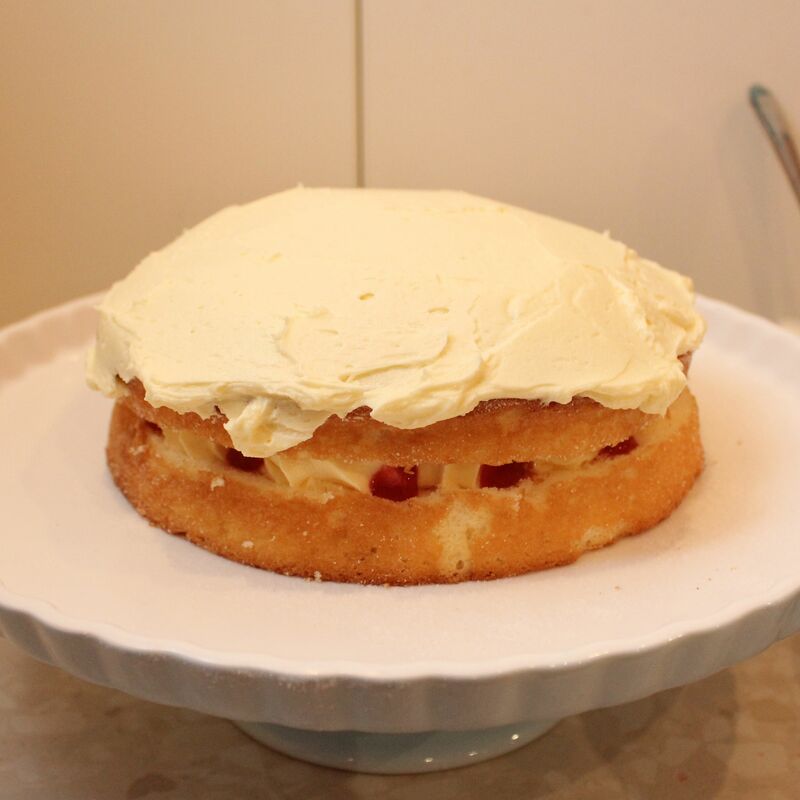 Using your spatula or palette knife, smooth the buttercream on top of the cake, but not down the sides. 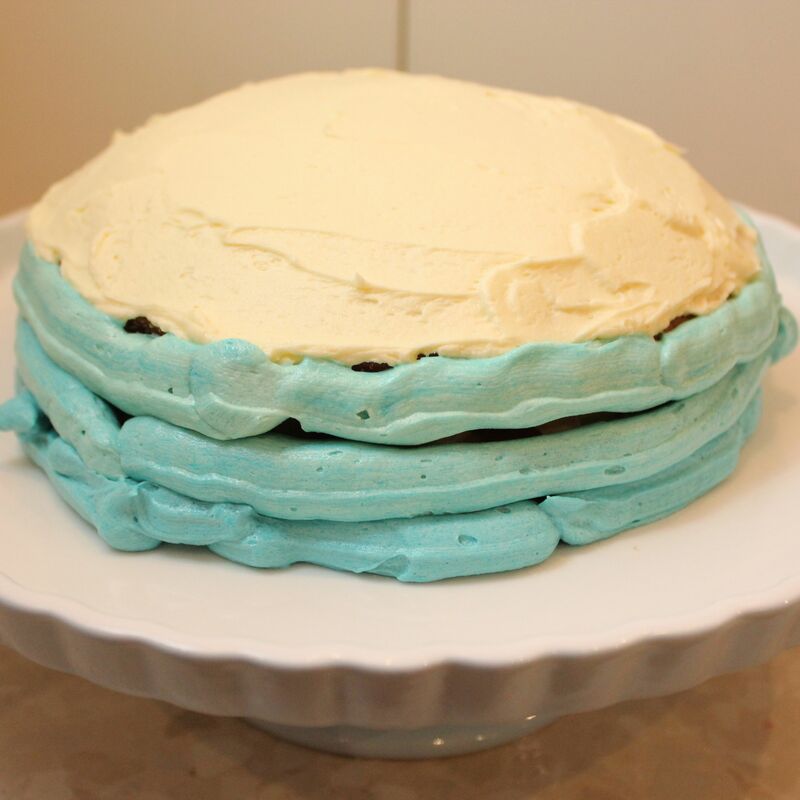 It’s absolutely fine if some of the icing hangs over the edge, it’ll make blending the ombre easier. I probably should have levelled the top of the cake, but hey, it has a rustic look! Working with your colour scheme and the size of your cake, tint your buttercream about three different colours. You don’t need a huge amount of each colour, at a guess half a cup. 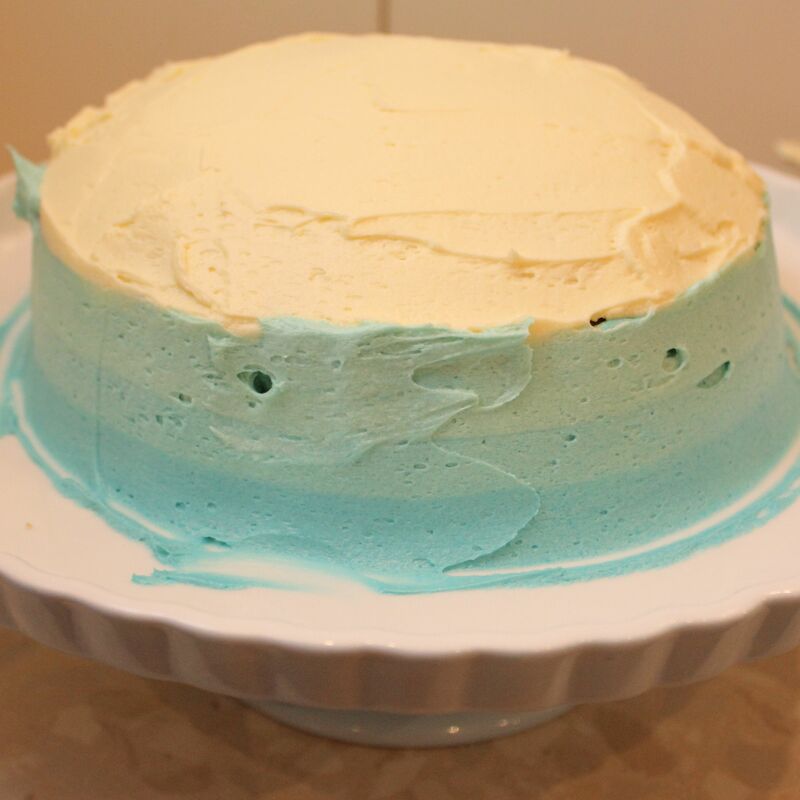 I used a blue colour scheme for the littlest lad’s first birthday cake smash. I used only three colours as my cake wasn’t very high, which was a shame. A taller cake would’ve been much more impressive! Now you’ll start to see your DIY ombre cake coming together. Put the darkest colour icing, or the colour you want at the bottom of the cake, into a piping bag with a wide round tip. Begin at the bottom of the cake and pipe rings of icing around the cake. Place the next colour (continuing this process for each colour) into the piping bag and pipe rings of icing around the cake until you reach the top. I used the same piping bag for each colour, my theory was that it’d help the ombre-ness. Don’t be too fussed about making this step perfect. Ideally you’ll have enough icing to make sure the cake is hidden once smoothed out and there should be an even amount of icing around the cake. When your cake has all it’s colour rings, start smoothing out the buttercream. Keep your palette knife straight (perpendicular to your cake) and rotate your way around the cake. Remove any surplus icing and make sure you clean your knife between each swipes. Now, this might not be the technically correct next step, but to smooth the layers, I used the same method as step 5 but placed my palette knife in warm water between each swipe. This seemed to both help the layers merge and gave a smooth finish. If you notice any gaps in the colours, gently add some icing of that colour. The final step of your ombre cake is to smooth the top. Ta-da you are all done! Time to let your little person mess it up with a cake smash. Or you could eat it, yummo. Are you ready to tackle ombre? It’s super simple. What colour scheme would you use? Pink would look gorgeous Gretta! What a great idea with the icing. 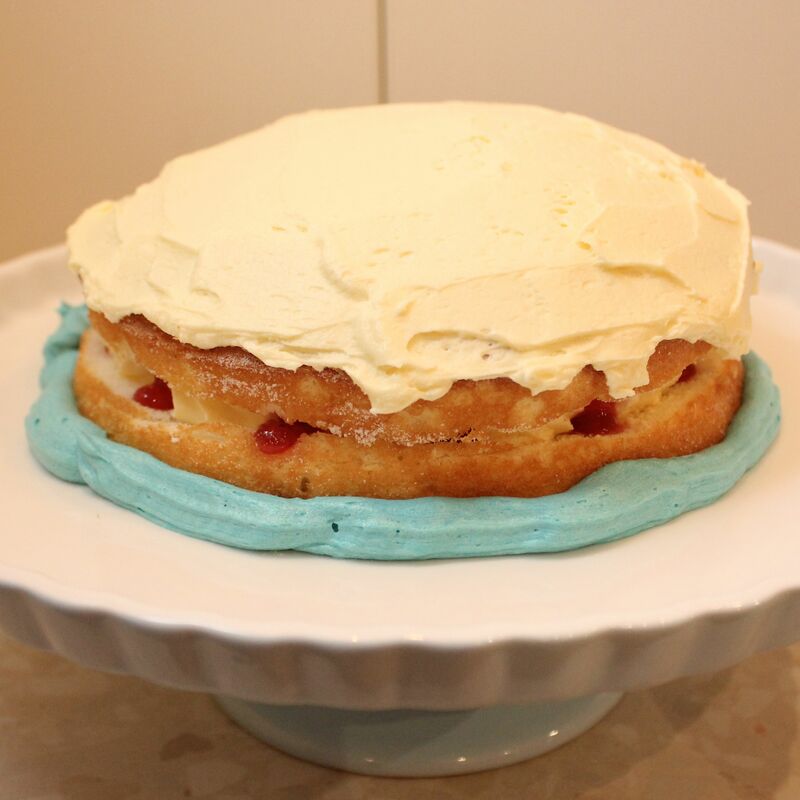 Have never made an ombre cake before thanks, might have to try it out! Thanks Stephanie, it’s an easy yet effective way to decorate a cake! Looks good! I’ll have to give it a try. I’m sure you’d nail it Christine! I’d be happy with any cake I didn’t have to make for my birthday! I’ve never tried ombre, I’m scared of food colouring but this looks great! Maybe I should give it a go?! Absolutely give it a go Haidee, it’s hard to muck up!